Linton Gilbertines Elgin picking up a 25,000gn price in the sale ring. 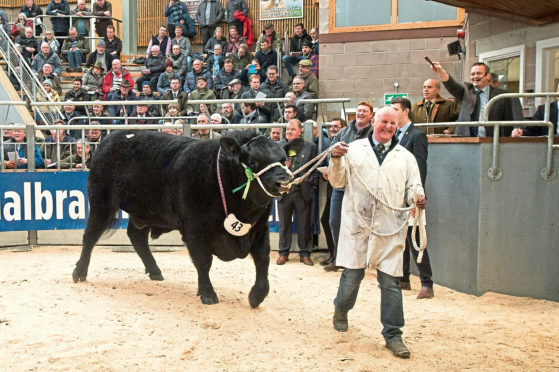 A powerful Aberdeen-Angus bull sporting a third prize rosette broke through the ranks to sell for 25,000gn at a breed sale which picked up momentum after a sticky start to trade. He was Linton Gilbertines Elgin, shown by John Elliot, a trustee of the Gordon Brooke Estate at Earlston, and bought by Ewan Brewis of the Eastfield herd at Kelso. This April 2017 sire by Rawburn Enigma, a first prize winner at last year’s Royal Highland Show, is a full brother of a bull which sold privately to Ballathie Estate for £30,000 and a stable mate of another sire which sold at the October 2018 sales for 22,000gn. Mr Elliot said: “Prizes don’t matter so much. “We knew we had a good bull with mass and breed character”. The Brooke Estate also sold Linton Gilbertines Phoenix for 9,000gn to Holystone Estate, Morpeth. The breed’s second top price was paid right at the end of the sale when the Tilsons from Wedderlie, Gordon sold Wedderlie Bright Man, a first prize winner, for 17,000gn to Glympton Farms in Oxfordshire. Aberdeenshire breeder, Neil Massie sold his first prize bull, Blelack Lord Heartford, for 15,000gn to Andrew Hodge, Rulemains Farm, Duns, and at 13,000gn the junior champion and reserve supreme, Logie Defiance from AJR Farms at Ellon was bought by WD Allen, Humblehaugh, Alnwick. The Borewell herd from Scremerston sold Borewell Black Magic, a son of Blelack Explosive, for 11,000gn to J&J Campbell, Wedderlie, Gordon, Berwickshire, and the reserve senior champion, Stouphill Mr Peroni, from William Allen, Stouphill, Alnwick was bought for 10,000gn by Robbie Galloway for his Cardona herd at Doune. At 8,500gn McCornick Evanader from Martin McCornick, Boreland, Newton Stewart, was bought by J&R Stanger, South Seatter, Sandwick, Orkney and two more sires sold at 8,000gn. The first, from the Frasers at Idvie, Forfar, was Idvies Private, a second prize winner, bought by W&E Brown, from Turnberry, Ayrshire, and the second was Hallington Jericho Eric from Alan Lawson & Son, from Newcastle, bought by Stobo Home Farms, Peebles. The supreme champion, Glassel Jeremy Eric, from Glassel Farms, Banchory made 6,000gn and was bought by the show judge, Tom Arnott, Haymount, Kelso. Ken and Margaret Howie’s Aberdeen-Angus female champion, Cairnton Elizabeth, made 6,000gn. In the Beef Shorthorn ring the prices were more closely matched to show placings, with the top price of 15,000gn paid for the supreme and junior champion, Podehole Landmark from the Horrells of Thorney, Peterborough. He sold to Gates Farming at Coldoverton. At 13,000gn the reserve senior champion from the Hon T Turton of Upsall, Thrisk was bought by DM Dickie, Knockenjig, Sanquhar, and at 8,000gn he sold another to SS Horton and Sons, Poulton Fields, Cirencester. At 9,000gn, Major Gibb from Glenisla House, Blairgowrie sold Glenisla Lochan Dubh, by Glenisla Jack Frost to C Lowther, Askhamhall, Penrith. Maj Gibb also sold his female champion, Glenisla Foxglove Flake, for 4,000gn to Irish buyer, A Shaw from Dungannon, Co Tyrone. Averages: Aberdeen-Angus – 88 bulls averaged £5,887, a rise of £141 from last year when 101 were sold. The clearance rate was 74%. Nineteen females averaged £2,147 and achieved a 100% clearance rate. Beef shorthorn – 41 bulls averaged £4,676, down by £1,127 on last year. The clearance rate was 58%. Fourteen heifers averaged £3,158, up £1,131 on last year.